A few years ago, I sat across from a young woman whose life was spinning out of control. She had initiated getting together, but her questions were half-hearted, and I knew she wasn't really interested in doing the right thing or in pleasing the Lord. I wanted to say just the right words, words that would resonate with her or spark some affection for the Lord. But my words fell flat, and our time together was awkward. The following week, I was reading in Ephesians and the words immediately made me think of the young woman and all the wisdom of that specific book that applied to her situation. If only I would have said this, if only I would have said that. It's all I could think of as I read, but I knew the time had passed and that I'd missed an opportunity with her. As I thought back about our conversation, I was deeply convicted. I had relied heavily on my own wisdom and experience, but I hadn't given her words with the ability to pierce the heart. I hadn't given her the Word. I hadn't given her the Word, because I didn't know it well enough. Sure, I could have plopped my study Bible on the table between us and said, "Hold on a sec while I try to remember where that verse is..." But some occasions call for more subtlety and sincerity, and that conversation was certainly one of those times. And I'm not a big believer in just throwing verses at people as a solution to their problems without listening well and helping them apply the principles of Scripture to their context. I decided then and there that if I were going to meet with women and offer them biblical counsel, I needed to know the Bible well, and not just know it but memorize it. I needed to be able to quickly draw on the Word no matter the situation, to give an answer in season and out. My next thought was, "I can't do that. That's impossible." Followed closely by, "I don't have time for that." But it just kind of felt like a line drawn in the sand by God, and I knew I needed to step over that line. Honestly, it felt more like an invitation, and I accepted with a mixture of fear and excitement. 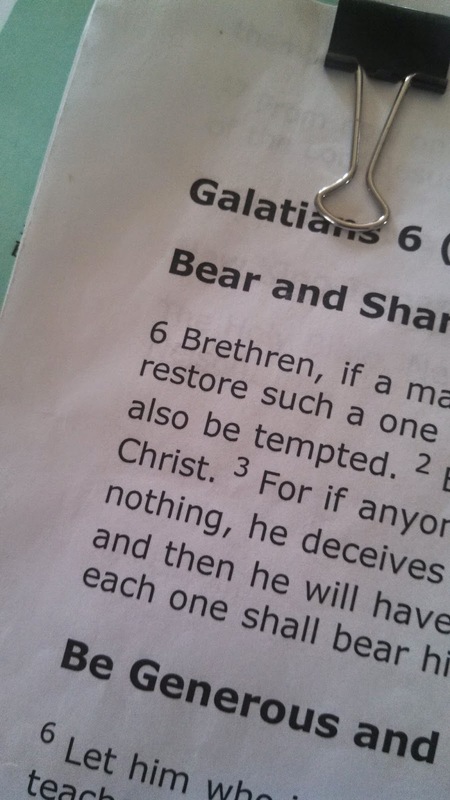 I remembered a friend mentioning a memory plan for memorizing books of the Bible, so I printed off Galatians (my favorite book of the Bible) from Bible Gateway and just went for it. What I realized right away is that I have a time everyday when I can work on Scripture memory: when I'm getting ready in the morning. I can say in the shower what I remember without looking and then work on the rest when I'm standing over the bathroom counter blowdrying my hair or putting on makeup. I cannot tell you how much I have benefitted from this practice! God brings things to mind that I've memorized, He's helped me understand difficult parts of what I've memorized because I repeat passages in the context they're written, and I've grown to love the Word even more than I did before. One of the best benefits is in teaching and counseling others; God has made good on the promise that if I memorized it, He would bring it to mind when I was counseling others. I don't say all this to you to draw attention to myself or to add one more thing to your plate that you should be doing. I say all this to you because you have the same standing invitation that I had to put Scripture to memory, to be endlessly blessed by it, to love the Lord your God with all your mind, and to be a more effective counselor in your ministry to other women. The system for memorization that I mentioned above is but one way of doing it. If you've memorized verses or passages or books of the Bible before, what system have you used that worked for you? And when in your day do you work on it?